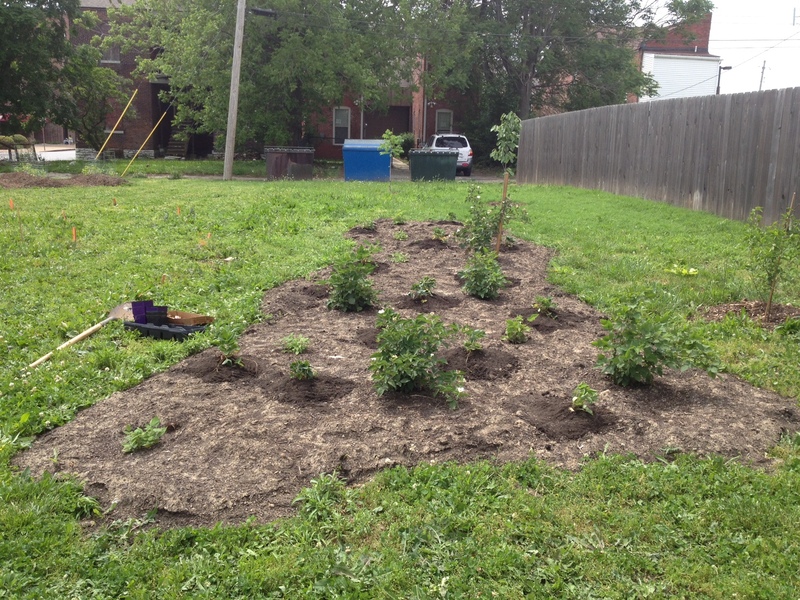 We’ve broken down our planting approach into two general areas: a native mini-forest of edibles along the west side of the site and a patch of cultivated crops on the south portion of the lot. Some of the cultivated crops are also planted around the sign for visual interest and along the fence since we ran out of room on the south part of the site (and this seemed like a good place for taller crops in the sun). 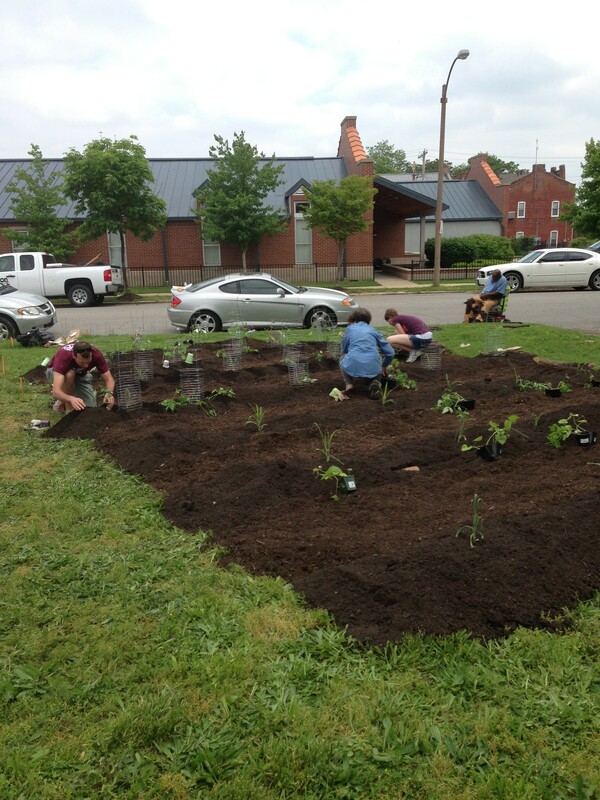 Our sources for the trees, shrubs and groundcover were Bowood Farms, Forrest Keeling Nursery, the Spring Wildflower Market at Shaw Nature Reserve (most of the plants purchased here came from Missouri Wildflowers Nursery), and the Missouri Department of Conservation. While we learned in conversations with archaeologists and an ethnobotanist that the Mississippians did not farm the “Three Sisters,” which is a polyculture used by other Native Americans consisting of corn, beans and squash, they did cultivate a groups of plants known as the Eastern Agricultural Complex. These plants consist of Cucurbita pepo (Squash), Helianthus annus (Sunflower), Chenopodium berlandieri (Lambsquarters or Goosefoot), Hordeum pusillum (Little Barley), Polyganum erectum (Erect Knotweed), Phalaris caroliniana (Maygrass), and Iva annua (Marsh Elder). 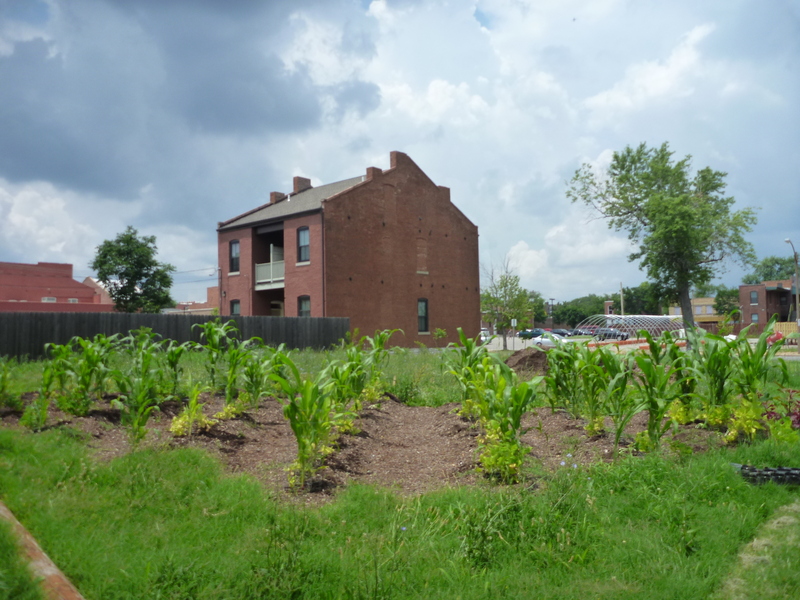 Nonetheless, we wanted to explore the Three Sisters since it is designed for the crops to mutually benefit each other, and polycultures like this represent sustainable approaches we are looking to dig into (pun intended). 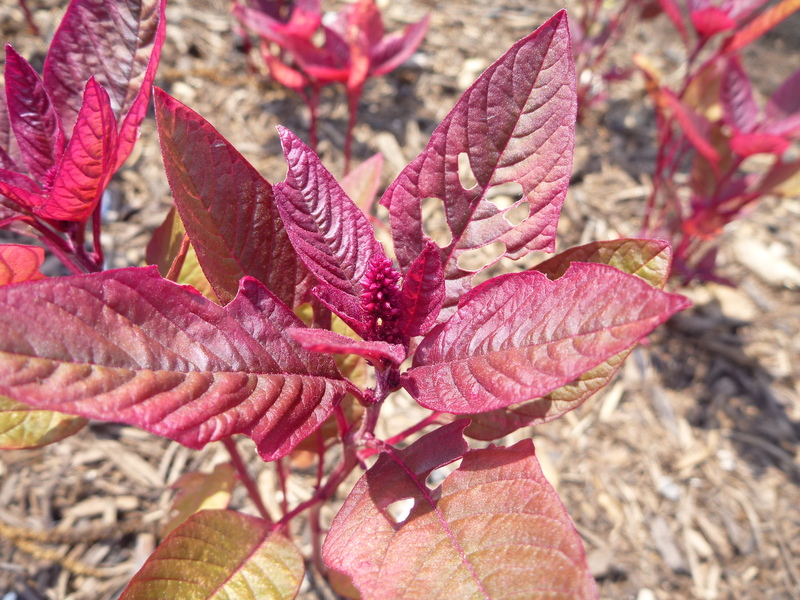 Also, it was difficult to find seeds for many of the plants in the Eastern Agricultural Complex, so we looked for near or distant relatives in their place, and explored some relatives more if many species were available (such as chenopodium spp), using heirloom varieties where possible. In the next couple years we would like to try to find a source for seeds of the actual species the Mississippians cultivated, if they are available. 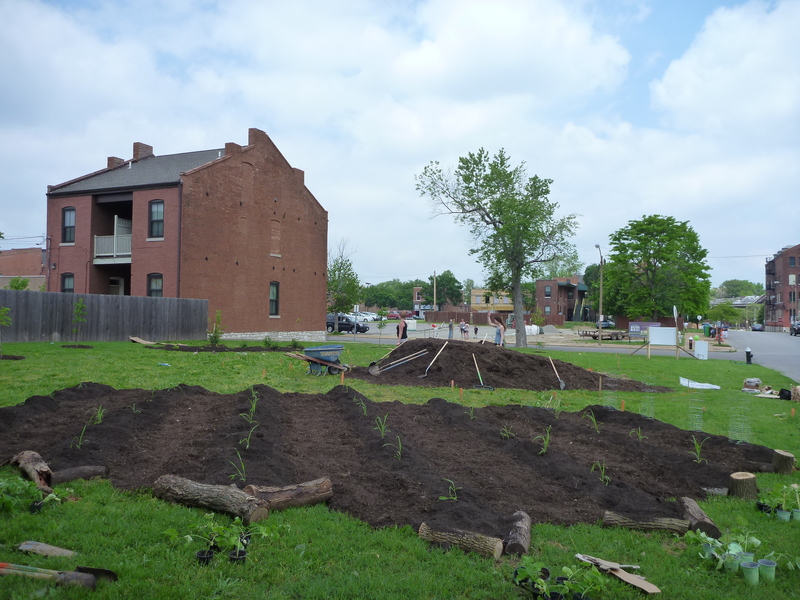 Thanks to all of the attendees and volunteers who came out on Saturday to support the Mighty Mississippians, as well as our fellow Land Labbers and the Old North House & Community Tour. The neighborhood was bustling with activity and the day was a great success! 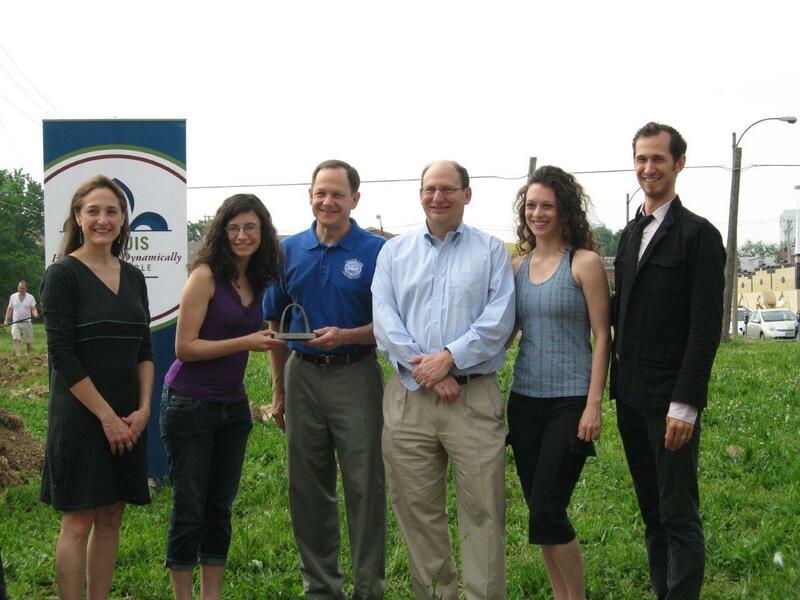 Mayor Francis Slay attended the official kick-off ceremonies (rescheduled from rained out date in April) for the Sustainable Land Lab projects and presented the winning team with recognition trophies. Rachel and Natasha accepted on behalf of the Mighty Mississippians. 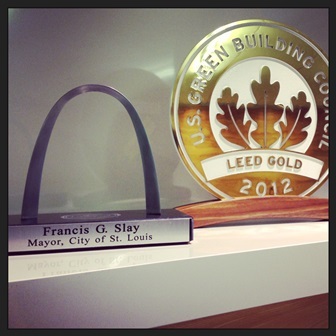 Our trophy now sits in the Christner office (in good company with our LEED Gold award from last year). 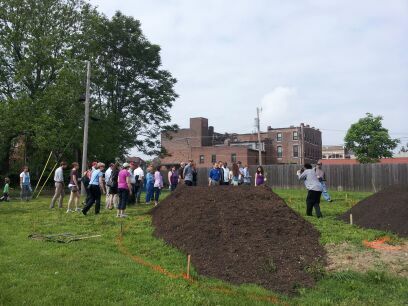 The Mayor, attendees, neighbors, and volunteers visited all of the Land Lab lots for a tour and description of implementation at each site. After the Mayor’s ceremony and visit, it was time to get to work. 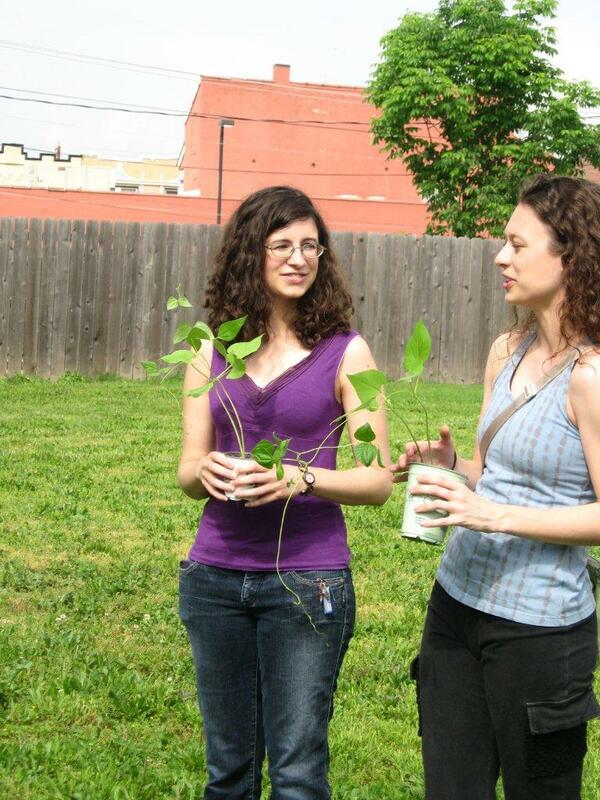 We had lots of beans and corn to be transplanted to our site. We used sheet mulching, a gardening technique that requires no digging into the ground, and imitates a natural process in the forest. We layered cardboard over the existing ground to prevent weeds from growing up through our beds and layered a raised bed planting mix from St. Louis Compost over the cardboard. 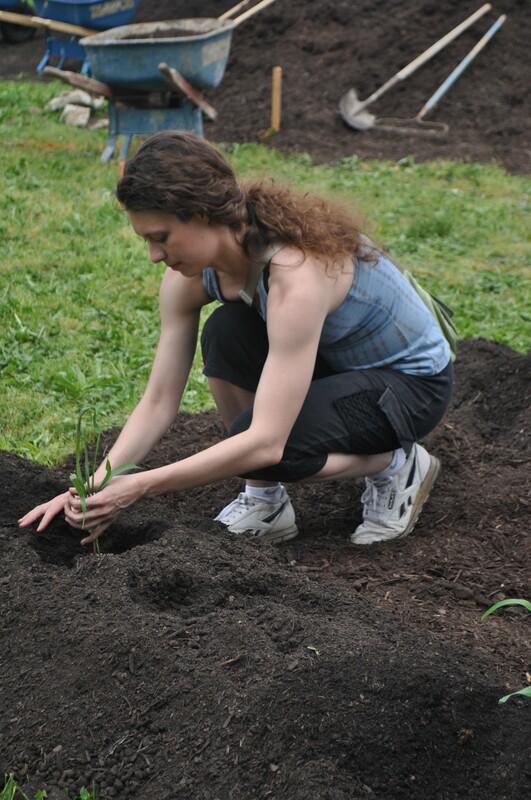 Once the cardboard and soil was laid, the planting began. Rows of corn were planted with 2-3 bean plants around each corn stalk. The corn will act as a pole for the beans and later, squash will be planted to serve as ground cover. 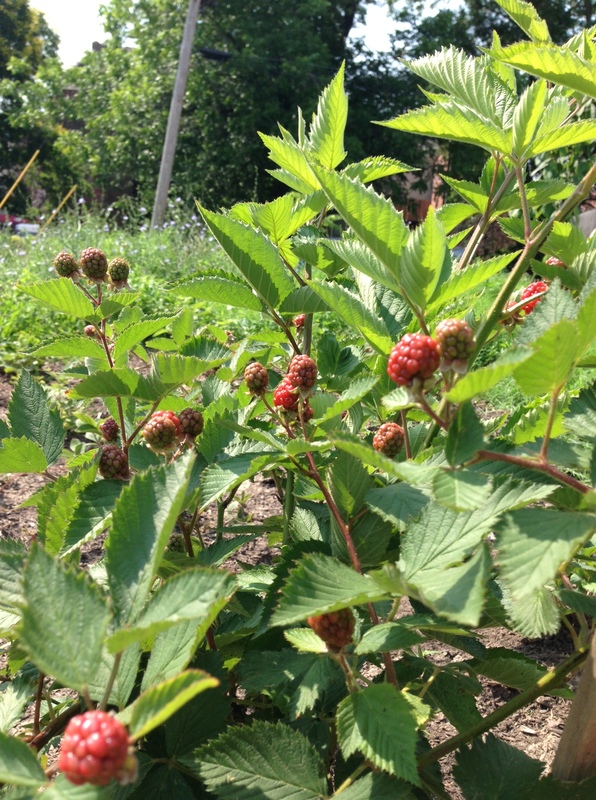 These three plants will have a symbiotic (mutually dependent) relationship. 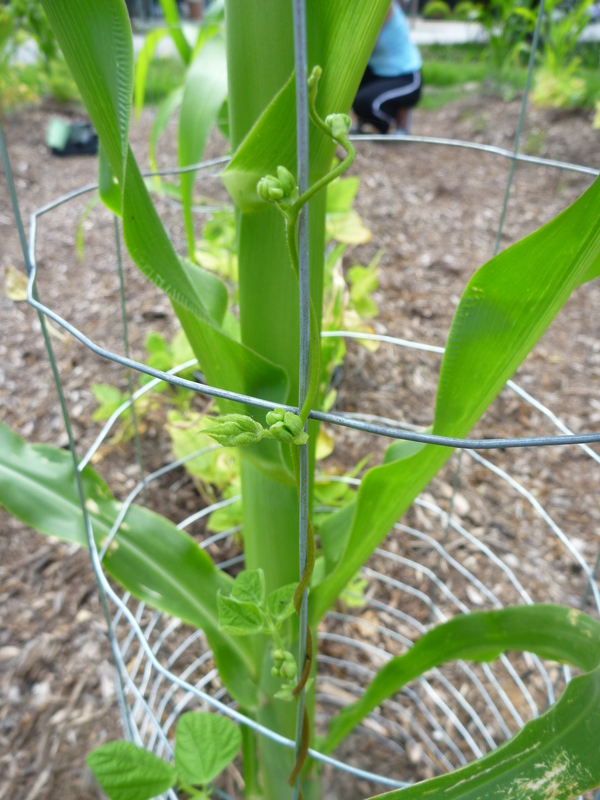 After planting the corn, we installed wire cages not only to protect the corn, but also to provide a temporary climbing structure until the corn is tall enough to climb on. After that we planted the beans. 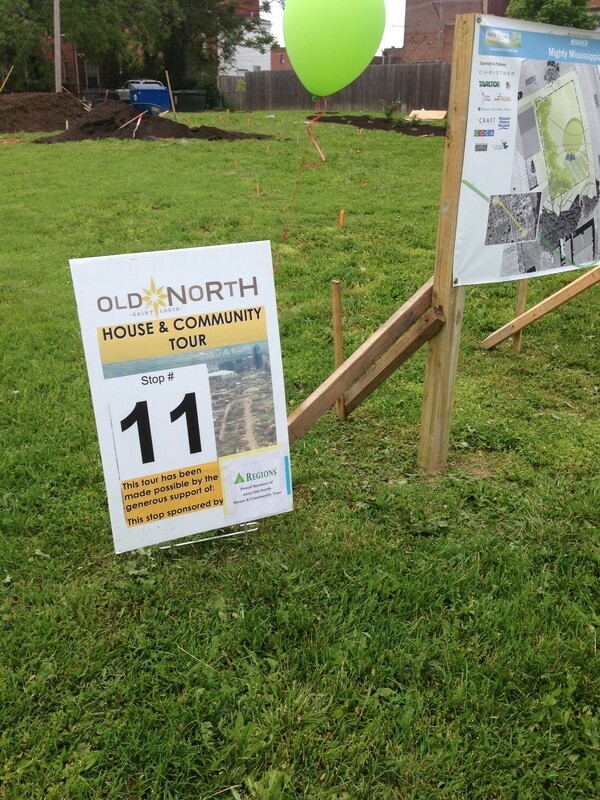 We had lots of visitors from the Old North House & Community Tour throughout the day. 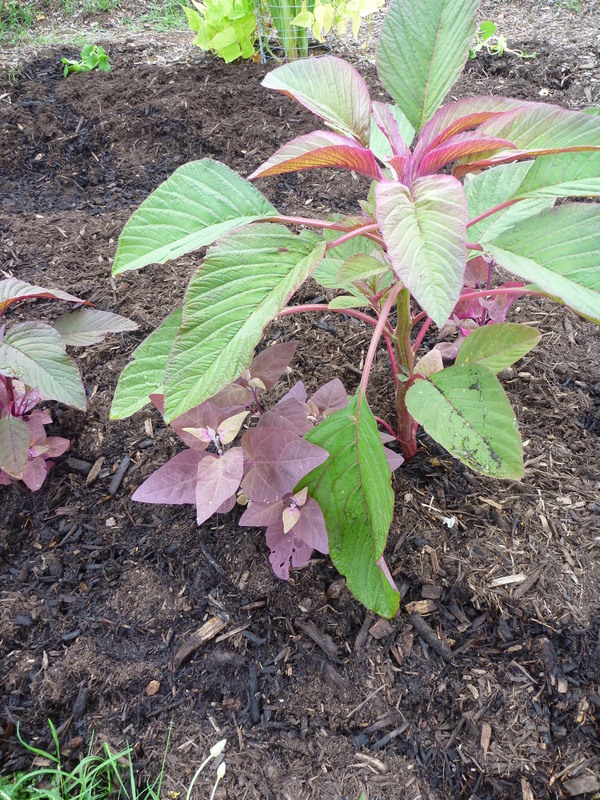 Emily planted red amaranth around our sign. It’s very small right now, but can grow up to 4-5 ft tall! 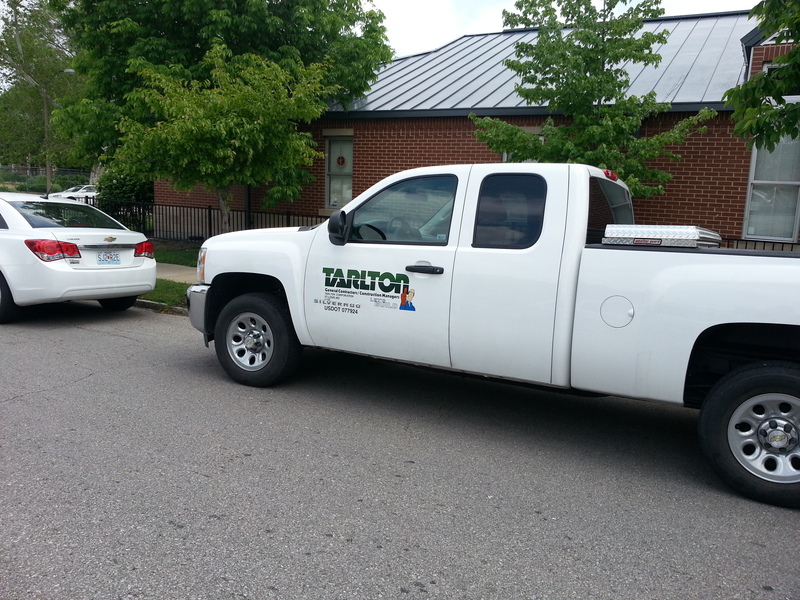 A huge thank you to our partner Tarlton, who donated tools, equipment, and of course, a helping hand! The rest of our site is making progress as well. Thanks again to all of our dedicated partners and volunteers who came out and helped, as well as those who have contributed along the way. We are making great progress and looking forward to the continued transformation! 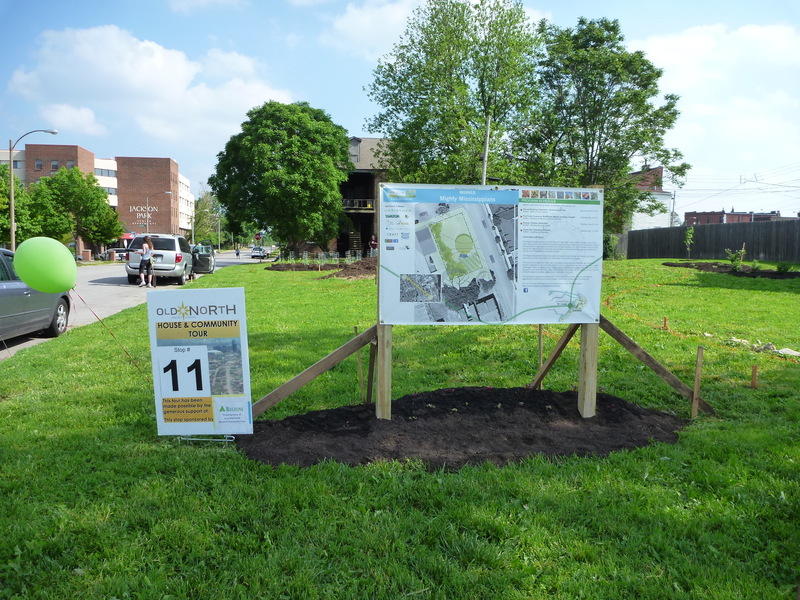 It’s exciting to be part of such a revitalizing and rewarding project!